Posh top scorer Marcus Maddison celebrates his goal for Posh against Bury. Photo: Joe Dent/theposh.com. Posh bounced back from the concession of a second-minute own goal from Hayden White to beat third-placed Bury 3-1 at the ABAX Stadium. 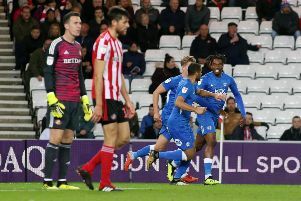 Captain Chris Forrester and top scorer Marcus Maddison shot Posh in front before an own goal from Anthony Kay completed the scorinbg. Shaquile Coulthirst is about to embrace Posh skipper Chris Forrester after the latter's goal against Bury. Photo: Joe Dent/theposh.com. It was the perfect response from a team who had slumped into the bottom half of the table before today’s game. But McCann, who sprang a selection shock by starting striker Shaquile Coulthirst for the first time cince August, believes such a win has been on the cards for a while. “I think we played as well in some of the previous games that we didn’t win,” McCann stated, “It was a very good performance though, once the first five minutes were out of the way. “The players could have been forgiven for thinking ‘here we go again’ after letting in an early goal, but from that moment they took control of the game and played very well. Young Posh midfielder Leo Da Silva Lopes shields the ball from Bury's Greg Leigh. Photo: Joe Dent/theposh.com. “They executed the gameplan perfectly. We wanted our full-backs to play high up the field, we wanted Shaquile and Tom Nichols to run in behind their back four because we knew our midfielders would take advantage of the space that left behind. We studied their recent matches and that’s how we felt we would hurt them and fair play to the players for carrying it out. “We have numerous midfielders - some of whom didn’t start today - who can control games and create chances and they proved it today. I’ve been on at Chris Forrester to score more goals for instance and the touch he produced before he scored was different class. “It also helped that we had a back four who played aggressively and on the front four. Ryan Tafazolli, Jack Baldwin and Andrew Hughes, and Hayden in the second-half, were first to everything and that gave us the platform to dominate the match. “The fans haven’t seen much of Shaquile lately, but we have been watching him closely in training and he has been impressive. After I told him I was leaving him out a few weeks ago he was a bit down for a couple of days, but since then he has knuckled down and worked hard in training and in under 23 matches when he’s been creating and scoring goals. “Shaq is an aggressive character and he gave us a bit of extra edge today. He runs hard at people and he closes them down,and Tom Nichols definitely benefitted from playing alongside him. “Shaq and Tom didn’t score, but they were a threat all game, and they made space for Marcus Maddison who can be hard to mark when playing just behind two strikers. Maddison picked up an ankle injury during the game, but it’s not thought to be serious - “I think Marcus needs molly-coddling sometimes” said McCann - while Forrester left the field early with nothing more than tired legs. McCann’s pre-match statement about fighting his way past negative comments was questioned after the game. “I didn’t feel I was under any particular pressure as there is pressure in every game of football,” McCann added. “But my policy all my career has been to ignore the people who want to hammer you and drag you down.